It’s easy to find people frustrated with their current product design and delivery process. They’ll list any number of maladies, from missing their customers’ true needs to forcing a buildout of unwanted features. Much of the time, many of their co-workers share that frustration. Yet, those organizations are petrified of changing the way they do things. They know they need to change, but the act of change frightens the life out of them. This ironic justification of desire and fear keeps them from making things better. Sure, they’ll announce “we’ll do it differently this time.” The executives will make proclamations about how they’re now a design-driven organization and how they’ll put the needs of customers first. There will be meetings about the new process, complete with powerpoint decks filled with box and arrow timeline charts. Then, after all that, they’ll return to doing things the way they’ve already done it. The next project will start the same way every previous project has, often with the ritual called The Gathering Of The Holy Requirements. A product owner will spew forth the two or three dozen new features they believe are required for the next release. User stories will be crafted and sprints will be scrummed. This new project will start like all previous projects have started. And it will end the way they’ve all previously ended, with the delivery of less-than-satisfying results. A thoughtfully-crafted, well-executed discovery phase can set an organization on a completely different path. More importantly, the discovery phase signals to the organization that, this time, the process truly will be different. And it does it with little fanfare and pomp. In fact, it’s often most effective when done in a bit of stealth mode, when only the direct participants are seeing the process. Dan Brown has spent the last few years taking apart discovery phases to learn how they can be most effective. He’s created a great framework for them. setting direction, where the team explores potential solutions and matches them up with the customer problems they’re solving. a later stage, where the team then converges, honing in on the specific problems and solutions they’ll tackle. If you’re already conducting design sprints or employing Lean UX, those are likely your discovery phase. However they aren’t the only approaches a team can employ. Experienced design leaders can create a bespoke workshop that includes activities such as user visits, competitive evaluations, group sketching, day-in-the-life narratives, and insight prioritization. The leader can tailor this to fit the needs of their specific projects. Dan recommends using the discovery phase to bring your design’s influencers together. When you lead the assembled group through the discovery phase activities together, the team will gain a shared understanding of both the customers’ problems and possible solutions. 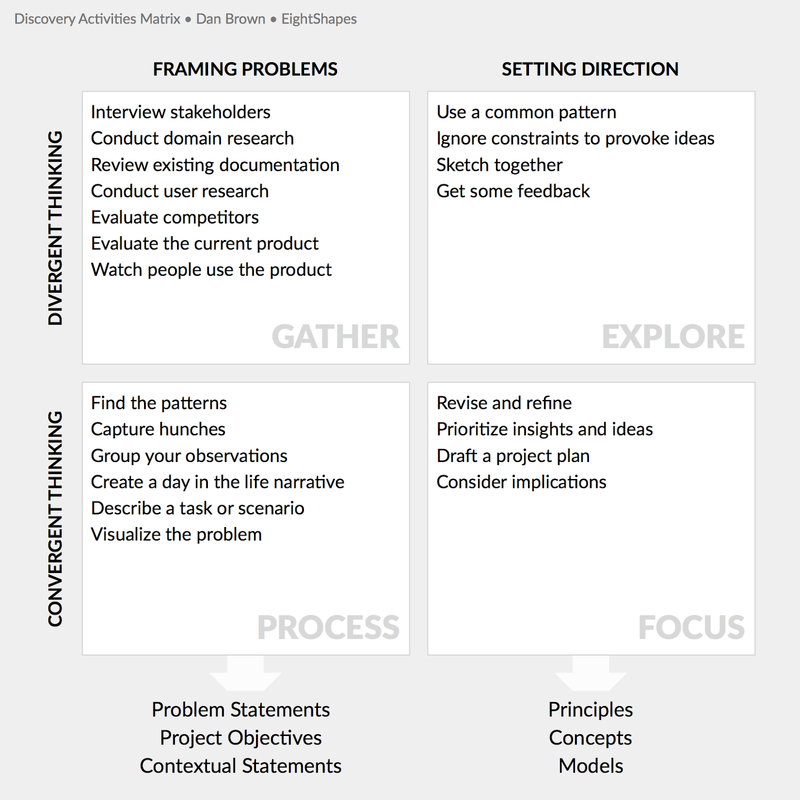 Using the discovery phase to frame the problem and set the project’s direction gets everyone on the same page. Space is indeed the final frontier. Nothing signals ‘something is different this time’ more than when you reserve a conference room for a week (or several). The same is true when you ask a group of important people to clear their calendar for a workshop. Organizations hold the space/time continuum as prime real estate and to reserve it means something big is happening. Add executive support and encouragement and now you’re sending a message that this is a big deal. The activities within the discovery phase also signal change. By drilling deep into the problems of customers, the team breaks the tradition of starting a project by jumping to the most obvious solution first. These activities focus on learning about the problem, such as customer visits, observing the customer support, interviewing salespeople, and exploring how well the competition meets your users’ true needs. The team will gain insights about their users they’ve never considered before. The leader of a well-designed discovery phase will recruit a multi-disciplinary team and assemble people who have different viewpoints about the project. These folks will participate in the project all the way through. A multi-disciplinary team likely breaks with tradition of only involving key people in small slices of the project, because it’s deemed wasteful to have them contribute outside their expertise. However, when they’re involved all the way through, they get the benefit of seeing what goes into a design. And by contributing their own expertise much earlier into the process, they provide insights that have previously been absent or discovered too late. Having these different folks contribute from the very beginning breaks with another long-standing tradition of relying on organizational seniority over who truly has the necessary knowledge and experience. The activities of a discovery phase equalize the role power in the room, letting everyone have a voice. It quickly becomes obvious that solid contributions can come from anywhere in the organization. For many organizations, this is a new way of doing business. One of the best benefits of a well-run discovery phase is the discomfort the participants will experience with the old ways things were done. What used to be considered acceptable (if not desirable) practices now are seen as non-productive. Instead, the team now wants these new practices that emphasize a shared understanding of what the team is building. The movement from requirements gathering to assumption validation is one common organizational shift that comes from introducing discovery phases. Teams realize they’ve been spewing requirements without any sense of whether they are truly needed or not. Now the team sees them as tools to, from the project’s start, understand what the customers’ need and what won’t matter. This creates a culture of questioning beliefs in a healthy way until they’re validated through research. Once shifts like these have started, the team finds it very difficult to fall back into their old habits. They’re more comfortable when everyone has a shared understanding. They create a common vocabulary to describe problems they’re solving. And they find they can move faster to produce better results, which in turn, makes the entire executive staff happier. Starting with a discovery phase for new design and development leads to better quality products and enhancements. Crafting it well can also signal that the organization is changing, by setting an example of how things are better from the beginning. Published here on August 24, 2016.